Clyde will start pre-season training just 38 days after their play-off defeat at Hampden. The Euros may get under way this Friday but it’s less than two weeks until Clyde’s players report back for pre-season training. And the club confirmed this week that the Bully Wee’s preparations for the new campaign will include a training camp in Jersey. The squad’s first pre-season training session will be on Tuesday, June 21, and they travel to Jersey two days later. Boss Barry Ferguson will spend five days on the island with the squad working on their schedule including an open training session on Saturday, June 25. 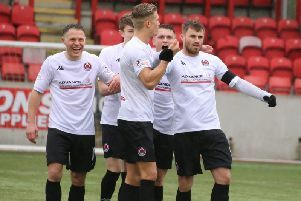 Clyde have also confirmed three pre-season friendlies – all at Broadwood – against Airdrie on Saturday, July 2, against Dunfermline Athletic on Tuesday, July 5, and against a Celtic XI on Saturday, July 9. The club’s first competitive outing will be the Betfred Cup tie with Kilmarnock on Saturday, July 16, while the Ladbrokes League 2 season gets under way on August 6. Manager Ferguson told the club website: “The trip to Jersey gives us the best possible opportunity to fully prepare for the season ahead. “It’ll be a demanding five days for the squad, with every day being used for double training sessions, which at that stage is the best way for us to prepare for the friendly matches to follow. “We’ll welcome any supporters that are in Jersey to watch our Saturday session and have a close-up look at how we work.